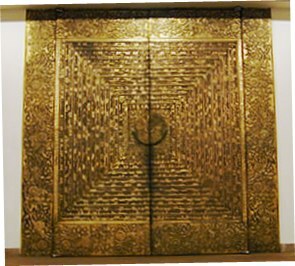 The main door of the Chamber inscribed with the Preamble to the Constitution of Sri Lanka in Sinhala, Tamil and English. On the borders are carved attractive lotus designs and decorative motifs which depict the art of ancient Sri Lanka. I am sorry for the numerous interruptions to the speeches of opposition Members of Parliament, since we must respect those who are willing to engage in debate instead of resorting to unparliamentary tactics. Also, I should note, the more we listen to the opponents of this amendment, the more clearly do we find inconsistencies and assertions that are not entirely accurate. Some of these have already been pointed out, as with the criticism of this Bill being urgent, even by those who wanted urgent implementation of the unworkable 17th amendment. That, it should be remembered, was rushed through with unseemly haste, and indeed contradicted some aspects of the 13th amendment, contradictions that have now been thankfully removed. I will not read out the whole of this speech, Mr Speaker, since I have little time, but with your permission I will table the whole, since I believe certain misleading statements should be corrected. For instance, when the Standing Orders were cited yesterday, and the Hon Leader of the Opposition, following the Hon ITAK National List Member, claimed that a required Resolution had not been placed before the House, he ignored the fact that the Standing Order referred to the List III in the 9th Schedule to the Constitution, a List that has not been touched upon in this amendment. Again, when it was claimed that the doctrine of the sovereignty of the people makes public consultation mandatory, the Hon Member was ignoring the specifications in the Constitution as to how that sovereignty is to be exercised. It is indeed sad when those who still hanker after the Westminster model of government do not seem to understand the basic principles of that government with regard to representation. But, whilst it would be entertaining to critique inconsistencies, more important I think are the basic principles in terms of which this amendment has been put forward. When this government was elected to office, it found itself required to engage in a great many structural reforms. Sadly, it has to proceed, in building a prosperous unified society, on the basis of a strange and confused constitution. That constitution, we all know, was formulated without any principles, grafting a Presidential system onto a Westminster style Parliamentary system. It was then amended madly in the first six years of its existence so as to subvert even the very few principles with which it had started, for instance the power of the judiciary, the provision against crossovers, a fixed term for the Presidency, a limited term for Parliament. In those days there was no resistance to such measures, least of all from those who now masquerade as defenders of democracy. Mr Speaker, in discussing possible reforms, I found in the first few months after the election that members of the opposition were obsessed with the idea that the Executive Presidency should be abolished. They were not prepared to discuss methods to increase the accountability of the office, though this is what they should have been concerned about. They should also, given the preference shown by the electorate to the Executive Presidential system, have tried to clarify the authority associated with that position. Sadly, that authority had been rendered ambiguous over the years, and it was necessary to clarify it, to remove the confusion that had been introduced by for instance the 17th amendment. I have consistently pointed out the absurdity of that amendment, which gave authority to a body appointed by a strange formula. On the contrary, where you have Presidential systems, appointments must be the prerogative of the President, though it is right and proper to limit his ability to appoint arbitrarily. Even under the Westminster system, though the Prime Minister has virtually an unlimited power of selection, the fact that the final appointment is by the Head of State ensures some limitations on absolute discretion. Now, under the 18th amendment, we have a Parliamentary Council which, if it does its job properly, would do even more, given the potentially public nature of the debate, to prevent the appointment of the unsuitable. I was glad in this regard that two members of the Council are appointed by the Opposition, since two heads are always better than one, in particular one that has made a fetish of avoiding accountability for a decade and a half. I should note however, Mr Speaker, that I would have wished the Council did not include the Prime Minister and the Leader of the Opposition by name. The former holds an Executive Office and the latter sees himself, if optimistically, as the Alternative Executive. It would have been preferable if the Council had consisted of five Members of Parliament without Executive responsibility. Unfortunately, in our strange Constitution which confuses the Executive and the Legislative in a unique fashion which we do not find in other countries with Executive Presidential systems, such a duplication of functions I suppose cannot be avoided. I would have wished too Mr Speaker that this first step in ensuring greater accountability in the President, by making appearances in Parliament mandatory, had also specified that he would be required to answer questions relative to his executive functions. I believe this is intended, given that His Excellency the current President enjoys Parliamentary debate, but we may have in some distant future a less sociable President without communicative skills who might not fulfil this provision in the spirit in which it is intended. With regard to the removal of term limits, Mr Speaker, I am at a loss to understand the objections, based as they are not on any political theory, but on the assumption that remaining in office for a long time is bad for both those in office and those who are governed. That is an argument based on practicalities, but as we know from Greek and Roman and American history – I need only mention Pericles and Franklin D Roosevelt – there will always be exceptions even in democracies considered ideal to rules or customs about term limits. When such extensions are in accordance with the democratically expressed will of the people, there can be no real objections. And in the present instance, as was graphically expressed in an article in yesterday’s ‘Daily Mirror’ by a distinguished Indian journalist, there are good practical reasons for not allowing extraneous considerations to enter into governance. In practical terms, this is likely to happen in the latter period of a second term presidency which must soon cease because of term limits, and which therefore loses its authority. Finally Mr Speaker let me conclude by congratulating the Leader of the Opposition on once again strengthening his own position by engaging in talks with the President. Four years ago he emerged from those talks so emboldened that he was able to dismiss the Hon Member for Gampaha from the post of Deputy Leader, an action that his then friends in the leading anti-government newspaper justified by claiming, falsely, that there was no position of Deputy Leader in that secret and perennially changing document known as the UNP constitution. That dismissal strengthened the government, just as this time round happened after his successful sidelining of opposition. Rarely can a man help his country while also helping himself, and we must be glad that the Opposition is blessed with such a Leader, who can now, with no consultation whatsoever, appoint 40% of the Parliamentary Council. May his advice, during doubtless the next fifteen years, be wise, and in the national interest as well as his own. For there is much more to accomplish, Mr Speaker, in the area of structural reforms. We need to move soon to a sane electoral system, to ensure authoritative representatives of the people in each individual constituency, while ensuring that Parliament itself is proportionately and properly representative of all our people. We need to amend the 13th amendment to ensure that ambiguities with regard to authority are ironed out, in particular with regard to the preposterous, carelessly constituted Concurrent List. We need to be clear about the authority of the Centre in basic areas, but should broadbase involvement in that authority through the establishment of a Second Chamber. For all this we hope that the Opposition too will act in the national interest, instead of using all issues as levers to undermine an elected government. As a result of the broad consensus this amendment has found, this government can even more confidently than before claim to represent a massive cross-section of our people. Now, with his authority over his own party now strengthened, the Leader of the Opposition too will we hope contribute to helping us build a prosperous unified society.